at Chabad Community Chanukah events! Over 250 men, women and children gathered together at the Flyers' Skate Zone for an evening of skating and Chanukah fun! Mr. Sam Beirig, friend and supporter of Chabad, lit the giant Chanukah Ice Menorah. What an incredible display of Jewish pride. Thank you to the Cherry Hill Police department for ensuring the safety and smoothness of the parade. The lighting of the 18' foot tall Menorah with hundreds in attendance to celebrate at Barclay Center, was spectacular! Rabbi Menachem Kaminker, Director of the Israeli Chabad Center addressed the crowd and Larry Koppelman, friend and supporter of Chabad was honored with the lighting of the Menorah. Thank you Mr. Eric Levy of Elite Heating & AC, Cherry Grill and Starlite Productions for their sponsorships. A very nice crowd joined Chabad in Medford at the Menorah Lighting on the third night of Chanukah. Mayor Jeff Beenstock addressed the crowd and lit the Shamash candle. 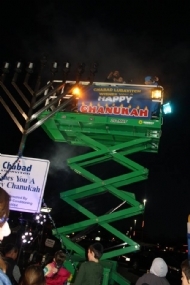 Dr. Len Rosenberg, friend and supporter of Chabad was honored with lighting the Menorah. Menorah Lighting on the fifth night of Chanukah. of Haddonfield, addressed the crowd and lit the Shamash candle . Lee Heimerlick, resident of Haddonfield, was honored with lighting the Menorah. The first-ever public Menorah kindling ceremony was held in Moorestown! 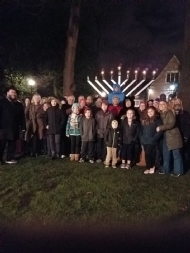 The lighting was held at the Moorestown Community House and was hosted by Chabad Lubavitch of Camden and Burlington Counties and the Moorestown Jewish Association. MJA representative, Marla Deibler, addressed the crowd, as did Moorestown resident, Edward Janes. 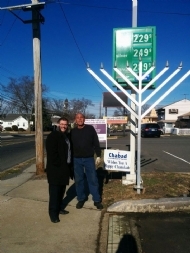 Reuven Cohen also of Moorestown, was honored with kindling the Menorah. Following the lighting, there were delicious latkes and donuts, chocolate Chanukah Gelt for the children, dreidels and family fun. It was a wonderful experience for everyone who joined us that night! Gearing up for Chanukah at Chabad Hebrew School was loads of Fun! Our Chanukah 2GO gifts boxes were enjoyed by all our students and their families! The Menorah competition brought out the awesome creativity of our Hebrew School students. Each menorah was uniquely impressive. It featured an olive press show, donuts making, lego dreidel building and chanukah sand art. At this year's CGI Chanukah Winter Camp, campers enjoyed Chanukah themed activities and daily Menorah lightings. It was a real way to transform their mid-winter break into a fun and exciting Jewish camp experience. Hundreds of children from local schools (Beth El, Temple Emanuel, JCC Pre-School, Adath Emanuel, MJA and more!) got into the spirit of Chanukah with Chabad's hands-on Olive Oil Press workshop. From the Cherry Hill Winterfest, the Moorestown Community House, to Bowers in Cherry Hill, Chabad-sponsored Menorah's lit up the night!